Do you fancy designing and making your own unique prints? During this workshop you will be taught how to make your own fabric screen which can be used to apply your own unique design to fabric. Once you have created your screen you will be able to practice applying a range of inks using pre-cut stencils onto fabrics. You are welcome to bring along your own pre-cut stencils to practice with if you prefer. 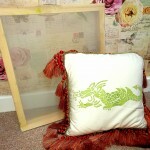 You will go home with your own wooden /fabric screen and squidgy so you can start creating your own unique, individual designs at home. Additional costs: Everything is included in the cost but if you would like to bring a pre-cut stencil or fabric to practise with please do. Please wear old clothing in case of ink splashing.